About Family Promise of Gainesville, Florida, Inc.
Family Promise of Gainesville is a shelter for working families with children. Imagine trying to do your homework while living in your car, and worrying about where your next meal will come from. 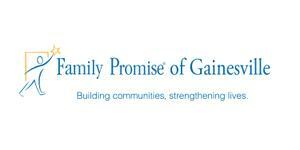 Family Promise gives both kids and adults the tools they need to break the cycle of poverty. Through the collaborations of local faith communities, Family Promise of Gainesville provides homeless children and their families with compassionate care that includes case management, education, housing, meals and transportation until they can transition to a home of their own.